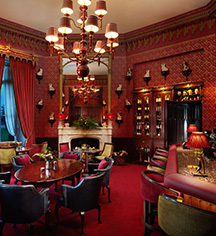 The Dromoland Castle Hotel's flagship restaurant, the Earl of Thomond, is revered for its panache, elegance, and innovation. This relaxed location has lavish décor, like Venetian silk, sparkling chandeliers, and magnificent views of the estate. The menu offers outstanding, authentic Irish produce from both land and sea, which is prepared with classical techniques by Executive Head Chef David McCann. 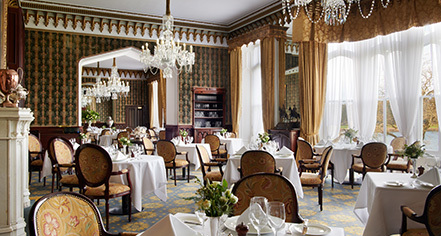 The Figtree Restaurant is in the Golf and Country Club at Dromoland Castle Hotel and is always buzzing with activity, laughter, and a lively atmosphere. Sunny in summer and cozy in winter, this restaurant offers guests and locals fare like sandwiches, steaks, fish and chips, salads, and chowder. Its goal is to provide a delicious menu full of big-flavored crowd-pleasers using delectable Irish ingredients. As one of the most beloved spots in the castle, the Gallery impressively captures the essence of Dromoland’s magic. Relax in a deep fire-side sofa or comfy armchair, while energizing for the day with coffee and scones or a light lunch. This relaxation inducing location surrounds guests with beautiful antiques, ancestral portraits, hunting mounts, and such comfortable furnishings that many linger longer than intended. Guests who prefer the privacy and comfort of their own guestroom or suite can take advantage of the full array of restaurant menus offered. Room service is available from 7:00 a.m. to 11:00 p.m. with a reduced nighttime menu from 11:00 p.m. to 7:00 a.m.